Characteristics, History of Horse-and-Rider Statues and Equine Sculptures.  Characteristics: What is an Equestrian Statue? Characteristics: What is an Equestrian Statue? In sculpture, the term "equestrian statue" describes a statue of a rider mounted on a horse. It derives from the Latin word "equus" (meaning "horse") from which we get "eques" ("knight"). If the horse is riderless, the sculpture is usually called an "equine statue". Since popes, politicians and even some kings rarely rode horses, equestian statues typically portrayed military commanders or militaristic leaders. Horses are notoriously difficult to render in either stone or bronze, and even the greatest sculptors experience technical difficulties of balance and weight-support. However, there can be few types of art as majestic as the immortal equestrian statue of Richard the Lionheart (1856) by sculptor Baron Carlo Marochetti (1805-67), which stands outside the British parliament building, in London; or the imposing Monument to Peter The Great "The Bronze Horseman" (1778, St Petersburg) by Etienne-Maurice Falconet (1716-91). Among the finest equine statues are the marble Horse Restrained by a Groom "The Marly Horse" (1739-45, Louvre, Paris) by Guillaume Coustou (1677-1746), and the bronze Horse with a Harrow (1878) by Pierre-Louis Rouillard, which stands outside the Musee d'Orsay in Paris. Equestrian reliefs are also known: an example from Ancient Persian art is the Equestrian Statue of Khosrau II the last great ruler of the Sassanian Empire on his favourite horse, Shabdiz (c.650 CE, Kermanshah, Iran). The history of sculpture has known countless equestrian statues, although few survive from antiquity. One of the oldest examples of equestrian statuary in Greek sculpture is the Rampin Rider or Rampin Horseman (c.550 BCE), unearthed on the Athenian acropolis. Featuring a kouros mounted on horseback, it exemplifies Greek Sculpture of the Archaic Period (600-480 BCE). Roman sculpture, being designed to showcase the power of Rome, included a large number of equestrian statues of Roman Emperors. Sadly, over the centuries, most have been melted down for church bells or coin. 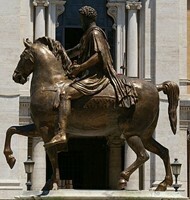 One famous surviving example is the Equestrian Statue of Marcus Aurelius (175 CE, Capitoline Museums). In traditional Chinese art, statues of rulers are quite uncommon, thus equestrian statues are extremely rare. Even the huge hoard of statues known as the Terracotta Army (c.246-208 BCE, Shaanxi province, China) has no statues of mounted riders. During the Middle Ages - that is, during the era of Romanesque and Gothic sculpture - Christian art dominated. Sculptors and stone masons were too busy coping with the demand for cathedral architectural sculpture to spare the time for equestrian monuments. There were exceptions, however, including: The Magdeburger Reiter (1240), a sandstone statue depicting Emperor Otto I and allegedly the first equestrian statue north of the Alps. Another celebrated medieval equestrian monument is the Bamberg Reiter (1225-37) at Bamberg Cathedral. The most celebrated wood carving of horse and rider is Saint George and the Dragon (1489) by Bernt Notke (1489) located in the Swedish brick-Gothic Church of St. Nicholas (Storkyrkan) in Stockholm. Equestrian statues were more popular in Renaissance art (1400-1530) in Italy. This was because of the involvement of Italian city states, like Florence, Mantua and Siena, whose leaders (the Medici family, Ludovico Gonzaga etc) needed commemorating in secular paintings and sculptures. Renaissance sculpture has two outstanding statues, both occupying important public spaces. First, there is the bronze Equestrian Statue of Gattamelata (1453), by Donatello (1386-1466), which stands in the Piazza del Santo in Padua. It is a portrait of the Renaissance condottiero (mercenary) Erasmo da Narni, known as "Gattamelata". In this work, Donatello was the first European sculptor to reintroduce the majesty of Classical equestrian portraiture. Less grand but more lively, is the gilded bronze Equestrian Monument of Bartolommeo Colleoni (c.1483-88) in the Campo dei Santi Giovanni e Paolo, Venice. Cast by the Florentine sculptor and goldsmith Andrea del Verrocchio (1435-88), it was paid for out of a substantial legacy left to Venice by Colleoni. 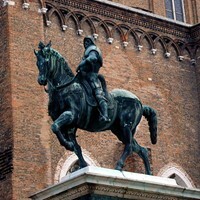 Other similar works by Renaissance sculptors include the equestrian monuments to Sir John Hawkwood and that of Niccolo da Tolentino (both located in Florence Cathedral), and Titian's 1548 equestrian portrait of Charles V. The last major 16th century work (Renaissance in subject and location, classical in style) is the bronze equestrian statue of Cosimo I de' Medici (1598) by Giambologna (1529-1608), located in the Piazza della Signoria, Florence. Finished by Giambologna's assistant Pietro Tacca (1577-1640), it was the first life-size statue to feature a ruler rather than a warlord. During the era of Baroque sculpture, which coincided with the age of Absolutism, equestrian statues were very popular with rulers, notably in France. Louis XIV, for instance, commissioned one for the Palace of Versailles, and another (by Francois Girardon) for the Place Vendome in Paris. Other examples include: the Equestrian Statue of Charles I of England (1633) by Hubert Le Sueur of 1633, which stands at Charing Cross in London; and the Statue of King Jose I of Portugal (1760) in the Praca do Comercio, sculpted by Joaquim Machado de Castro. Neoclassical sculpture features several fine horse-and-rider monuments including: the Equestrian Statue of Joseph II (1795-1806), by Franz von Zauner (1746-1822), in the Josefplatz, Vienna; the Monument to Prince Jozef Poniatowski (1826-7) by Bertel Thorvaldsen (17701844), in Warsaw; and the Statue of Archduke Karl, Duke of Teschen (1860-65) on the Heldenplatz in Vienna, the largest equestrian sculpture in the world with only two support points. But perhaps the greatest neoclassical equestrian statue is The Bronze Horseman (1766-82), by Etienne Maurice Falconet (1716-1791), which stands in Decembrist Square, St Petersburg. This famous monument commissioned by Catherine the Great, which stands on the largest stone ever moved by man (the Thunder Stone), is to St Petersburg what the Statue of Liberty is to New York. During the era of modern art (c.1850-1960) equestrian sculpture gradually faded, as horses were replaced by the motor car. American sculptors produced a number of equestrian monuments such as: Clark Mills' bronze of Andrew Jackson (1852), the first American sculpture to depict a rearing horse, located in Lafayette Square in Washington DC; and the bronze equestrian portrait of George Washington (1856) Union Square, New York. In London, meanwhile, the Italian-born French artist Baron Carlo Marochetti sculpted the equestrian statue of Richard Coeur de Lion (1856, Palace of Westminster). In India, the Equestrian statue of Rani Lakshmibai (1890) - one of the leading figures of the Indian Rebellion of 1857 - was commemorated in a monument near Shivranjini, Ahmedabad. Equestrian works have been relative scarce during the 20th century, although quality remains high. An early outstanding work by a modern American sculptor was the End of the Trail (1915, National Cowboy & Western Heritage Museum, Oklahoma City) by James Earle Fraser (1876-1953). In 1950, the animalist Anna Hyatt Huntington (1876-1973) produced her fabulous aluminium Fighting Stallions, now in Brookgreen Gardens, Murrells Inlet, South Carolina. In 1954, Juan Cristobal Gonzalez Quesada produced his evocative Statue of El Cid (Rodrigo Diaz de Vivar 10431099), which now stands outside the entrance of Burgos Cathedral in Spain. In recent years, gigantism has reared its head in the field of plastic art. The Genghis Khan Equestrian Statue at Tsonjin Boldog, not far from Ulan Bator, Mongolia, is currently the largest horse-and-rider stone sculpture in the world. This will be overtaken shortly by the Crazy Horse Memorial, in South Dakota, USA, which will be 641 feet (195 m) in width and 563 feet (172 m) in height. The world's largest equestrian bronzes are the Juan de Onate Statue (2006) in El Paso, Texas; and the Statue of Jan Zizka (1950) in Prague. Equestrian monuments can be seen in some of the best art museums and sculpture gardens around the world.  For more about horse statues, see: Homepage.